​​Where Do Bed Bugs Lay Eggs? Most home owners are aware of the dangers of bed bug infestations, which can quickly become a very annoying and expensive inconvenience. However, too many times the wrong approach is used to deal with bed bug infestations, as a lot of people are incorrectly worried only about the bugs themselves and not the eggs. Considering that after reproduction, female bed bugs can lay between one and twelve eggs per day and they hatch within one to two weeks, any approach designed to rid your home of bed bugs must also have a strategy for killing the eggs. But first, you have to find out where the bugs have hid them. This article will go in-depth to describe each common area in which a female bed bug will decide to lay her eggs. How Do Bed Bugs Decide Where To Lay Eggs? One of the first places that you should look is inside of your box spring. 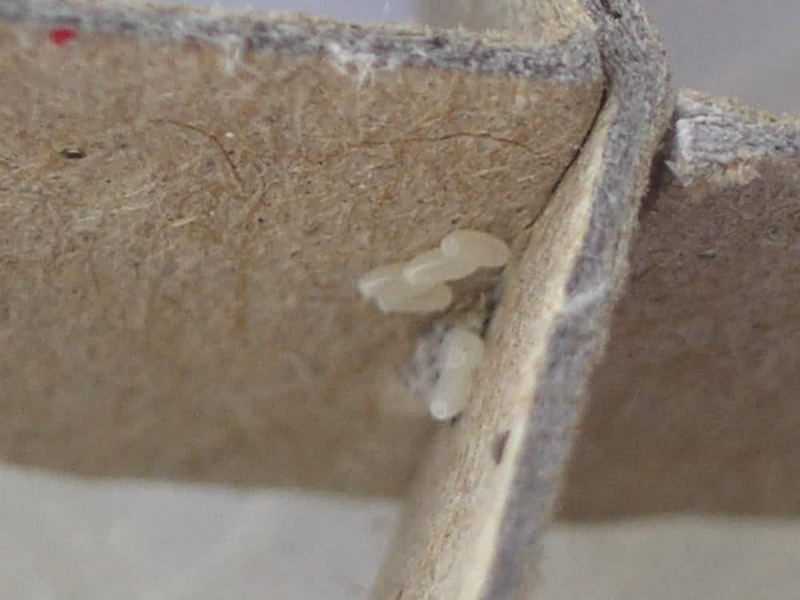 Many people check their mattresses first, but the dark, unbothered areas of a box spring also provide an ideal place for bed bugs to hide out between feedings. Make sure to check the top, bottom, and sides of your box spring, being very thorough about your search all the while. Make sure to completely lift up your mattress as you search for bed bug eggs. As beds are clearly one of the more popular places for bed bugs to gather, they are also likely to lay their eggs underneath your mattress. However, you should also check the areas around your bed frame, as these spots also tend to be popular places to leave eggs. Sometimes, many people will incorrectly assume that because they are called bed bugs, the only place that bed bugs are likely to gather, live, and lay eggs are in and around your bed itself. This is not always true, however. Bed bugs have also been known to gather in and around other bedroom furniture. Nightstands, dressers, and other areas provide dark places where bed bugs won't be bothered and can lay their eggs. 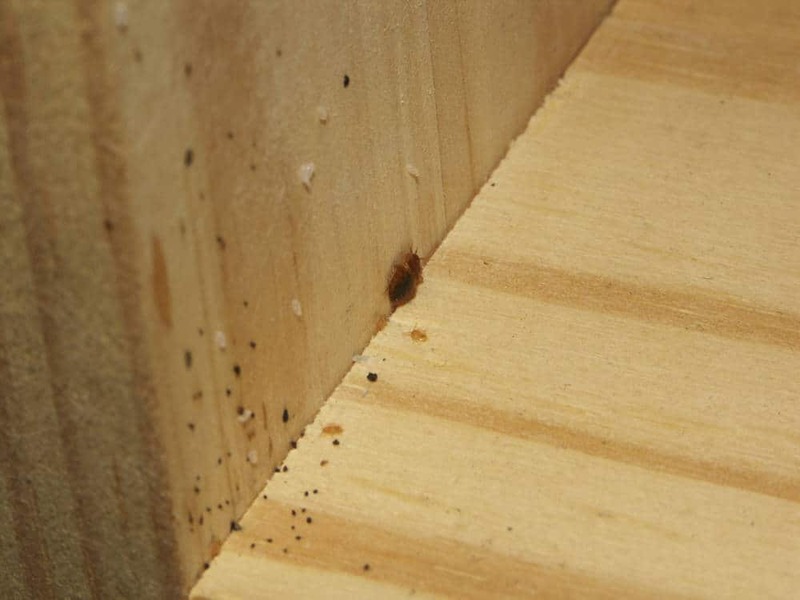 Bed bugs don't create nests as such, but do tend to stick together in tight spaces. As you keep in mind the fact that bed bugs don't want to be too far away from their human food sources, but still like to be in secluded spaces, check behind your bedroom curtains whenever you suspect that you may have a bed bug problem. These can be attractive locations for bed bugs to lay their eggs. This is particularly true because of the dark refuge that curtains can provide. Also, the fabric of curtains can make them an attractive spot for bed bugs to go and leave their eggs at. 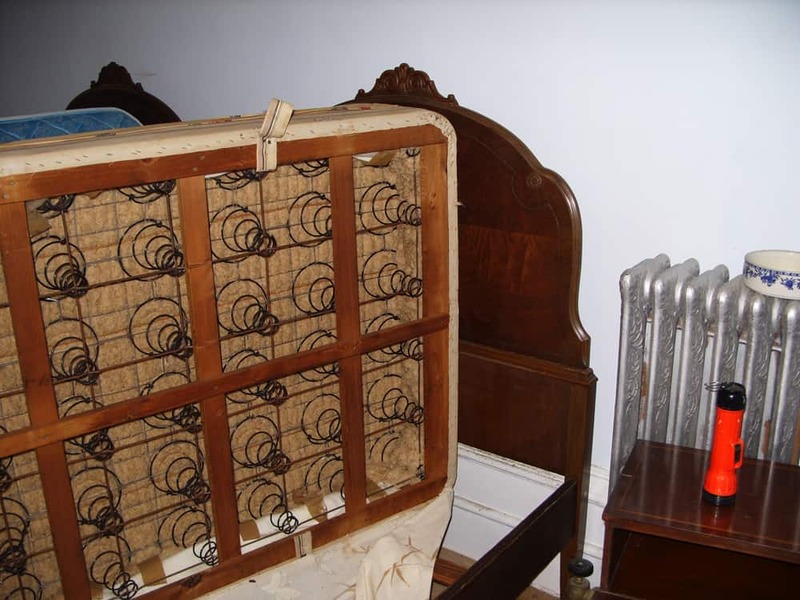 Bed bugs may like being in your bed frame, inside clothing, and so forth, but they certainly do not need to gather only where there are soft fabrics or other materials. They are also more than happy to gather in cracks or crevices. 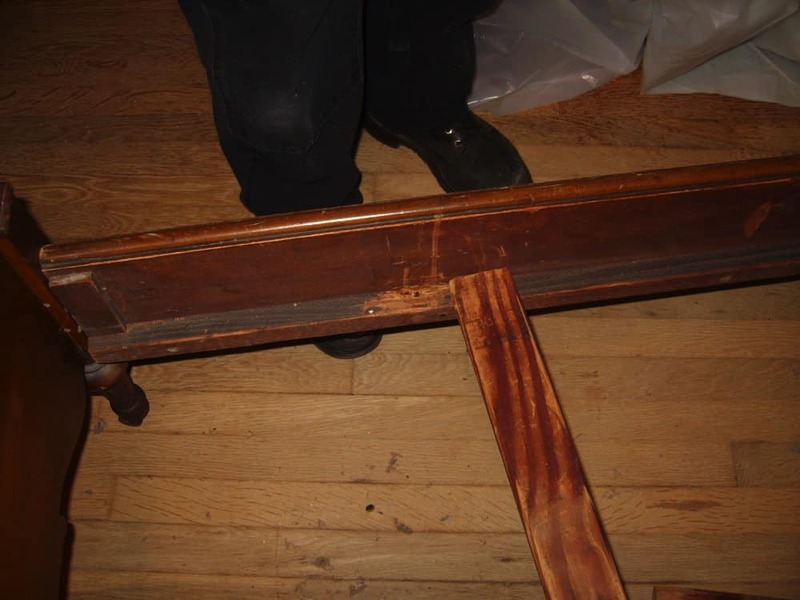 If you think about it, a slight crack in the wall or crevices behind furniture provides everything that a bed bug needs: in particular, it gives them a safe, secluded area where their eggs are not likely to be bothered. At the same time, it's in the area that humans spend much of their time still so that when it's feeding time, the bed bugs can still get access to food sources. You should not just check the obvious places when you look for bed bugs and their eggs. With no other location is this more clear than with electrical sockets. It may seem crazy for a bed bug to lay eggs within an electrical socket, but if it is unused, it just looks like a little hole to a bed bug. They won't get electrocuted and their eggs are likely to be fine in an unused socket. Use a magnifying glass and a flashlight to check within your plug sockets if you know that you have a bed bug issue. You may be surprised at what you see in there if you take a good, careful look inside. Remember, bed bugs will inhabit anywhere that humans do, including places you'd least expect. 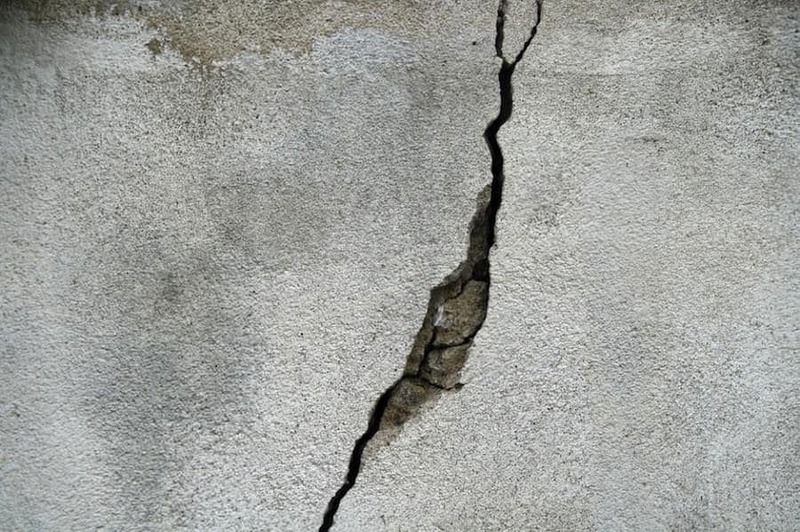 For this reason, don't assume they will only be found in the areas mentioned above - you may have to get creative with your searches if you suspect there may be other unusual areas in which they could be lurking. Also, when human activity is scarce (if everybody in your house went on holiday, for example), bed bugs are likely to try to feed on the next best thing, which can be dogs, cats, and other pets; so make sure you check around animal bedding etc for bed bug activity, too. You have probably noticed a pretty clear pattern here. Although we have discussed some of the more common areas in which bed bugs lay their eggs, the list is certainly not confined to these several types of places. It may be best to consider not only specific places, but also specific features of a place where bed bugs may lay eggs. Try to think of anywhere that is mostly undisturbed by humans or pets. At the same time, it should be some place close to where humans spend time, since they don't like to go far away from their food sources. Bed bugs are not capable of making nests, but they do tend to stick together in tight spaces, so use this knowledge to your advantage. Finally, the temperature range has to be appropriate for the eggs to survive in. This means that if you have a basement that gets pretty cold or an attic that gets very hot, it wouldn't be an attractive site for bed bugs to lay their eggs. Aside from not being properly climate controlled, those spots are likely too far from humans. Optimal temperature ranges for bed bugs and their eggs tend to be pretty similar to normal room temperatures. You will need to know exactly what you're looking for in order to ensure that you can identify bed bug eggs properly in the event that you encounter them. Here are a few things that can help you properly identify the eggs. First of all, keep in mind that bed bug eggs are very tiny. They are often only the size of a pinhead, or half of the size of a grain of rice, so you may need to use a magnifying glass as you search for them. A flashlight can also be helpful, considering that bed bugs like to store them in dark crevices when possible. 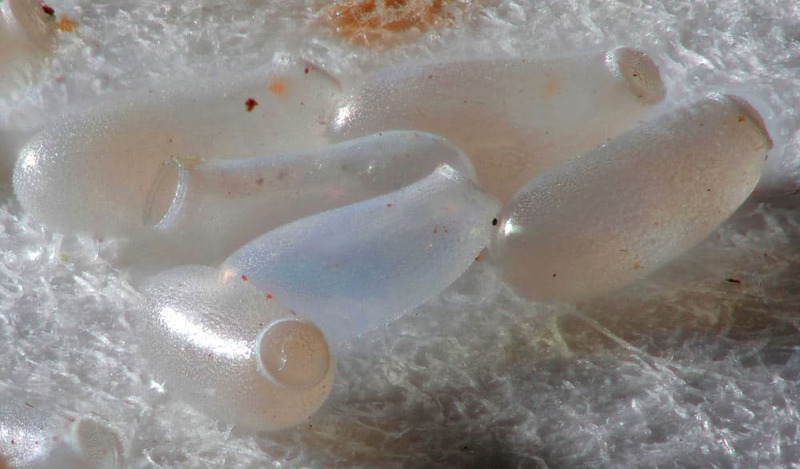 The color of bed bug eggs tend to be pearl-white, unlike the darker colors of a hatched bed bug. If eggs are more than a few days old, they also may have an eye spot, which simply looks like a pair of little black dots. If you should be unlucky enough to have to deal with a bed bug infestation, you can't afford to ignore the eggs themselves. Removing bed bugs won't help if the eggs are left to hatch and the resulting bed bugs allowed to grow and lay more eggs. These tips and guidelines should help you find eggs so that they can be dealt with appropriately.